Applied biomathematicians, orthopedists, clinical orthopedists. Biological and Synthetic Apatites (R.Z. LeGeros). Calcium Phosphate Apatites in Nature (D.K. Smith). Hydrothermal Processing of Hydroxyapatite: Past, Present, and Future (M. Yoshimura and H. Suda). Formation and Dissolution Mechanisms of Calcium Phosphates in Aqueous Systems (G.H. Nancollas and J. Zhang). Pathological Crystallization of Calcium Oxalate and Calcium Phosphate (S.R. Khan and R.L. Hackett). Characterization of Mineral Phases in Cardiovascular Calcification (B.B. Tomazic). Chemistry and Structure of Calcium-Containing Coatings and Modified Surfaces for Titanium Alloy Orthopedic Prostheses (M. Spector, J.G. Hanlon, G.H. Nancollas). 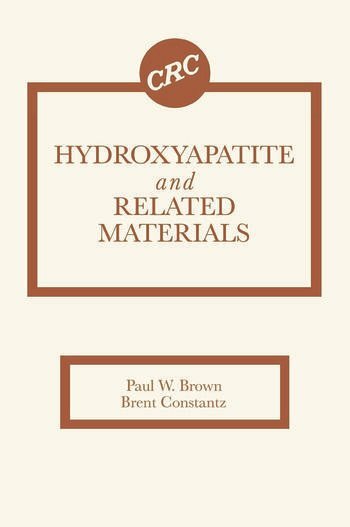 Formation of Hydroxyapatite in Cement Systems (L.C. Chow, S. Takagi, and K. Ishikawa). Octacalcium Phosphate Carboxylates. 5. Incorporation of Excess Succinate and Ammonium Ions in the Octacalcium Phosphate Succinate Structure (M. Markovic, B.O. Fowler, W.E. Brown). The Effect of Ethanol on the Solubility of Hydroxyapatite in the System Ca(OH)2-H3PO4-H2O at 25° and 33° C (M.S. Tung, C. Lin, T.H. Chow, and P. Sung). Constant-Composition Study of the Precipitation Behaviour of Calcium Phosphate in the Presence of Non-Collagenous Bio-Chemicals (A.T.-C. Wong and J.T. Czernuszka). Dual Constant Composition Kinetics Studies of Ceramic Hydroxyapatite and Hydroxyapatite Plasma Coated Implants (E.P. Paschalis, B.E. Tucker, S. Mukhopadhyay, K. Wikiel, N.B. Beals, J.A. Bearcroft, M. Spector, G.H. Nancollas). Comparative Utility of Mineralized Collagen as an Osteoinductive Material (S. Gunasekaran, I.C. Bathurst, B. Constantz, J. Quiaoit, J. Ross, P.J. Barr, and D. Gospodarowicz). Maturation of Poorly Crystalline Synthetic and Biological Apatites (C. Rey, H-M. Kim, M.J. Glimcher). Prediction of Precipitation and Transformation Behaviour of Calcium Phosphate in Aqueous Media (A.T.-C. Wong and J.T. Czernuszka). The Role of Interfacial Chemistry in Surface Nucleation and Growth of Calcium Oxalate Monohydrate (L. Song, A.A. Campbell, and B.C. Bunker). Effect of Particle Size of Metastable Calcium Phosphates on Crushing Strength of Self-Setting Bioactive Calcium Phosphate Cement (M. Otsuka, Y. Matsuda, Y. Suwa, J.L. Fox, and W.I. Higuchi). An Hydraulic Cement for Biological Uses (E. Mejdoubi, J.L. Lacout, P. Michaud, and P. Rodriguez). Synthesis of Dahllite: The Mineral Phase of Bone (I.C. Ison, M.T. Fulmer, B.M. Barr, and B.R. Constantz). Deposition of Hydroxyapatite Coatings by Laser Ablation (G. Sardin, M. Varela, J.L. Morenza). Grafting of Phosphorylated Molecules on Apatite Surface (A. Lebugle, M. Subirade, and V. Delpech). Influence of the Crystallinity of Plasma Sprayed HA-Coatings on Their Osseointegration (P. Frayssinet, P. Conte, F. Tourenne, and N. Rouquet). In Situ TEM Observation of Radiation Induced Amorphization of Crystals with Apatite Structure (L.M. Wang, M. Cameron, W.J. Weber, K.D. Crowley, and R.C. Ewing). Carbonate-Containing Europium Apatite (J.L. Lacout and A. Taïtaï). Apatite Channels and Zeolite-Like Properties (C. Rey). Preparation of Calcium Phosphates Powders by Water Extraction Variant of Sol-Gel Process (A. Deptula, T. Olczak, W. Lada, A. Borello, C. Alvani, L. Lorenzini, and A. DiBartolomeo). Thermal Stability of Synthetic Hydroxyapatite (Y. Fang, D.K. Agrawal, D.M. Roy). Human Bone Marrow Cell Culture-Analysis of Cell Behaviour at Biocompatibility Testing of Ceramics (A. Wilke, S.V. Hirschheydt, and J. Orth). Mineral-Organic Interfacial Bonding: Effect of Strain Rate on the Mechanical Properties of Bone (W.R. Walsh, H.D. Kim, D.P. Labrador, N. Guzelsu). Structural Analysis of the Human Tooth Enamel by Transmission Electron Microscopy (J. Reyes-Gasga and C.M. Alcántara-Rodríguez). The in Vitro Growth Potential of Human Bone Derived Cells on Polytetrafluoroethylene Grafts (M.L. Olmedo, A.-P.C. Weiss, W.E. Walsh, L. Zou, M.G. Ehrlich). Ultrasonic Properties of Cortical Bone Following in-Vitro Fluoride Ion Treatment (W.R. Walsh, D.P. Labrador, H.D. Kim, and N. Guzelsu). XPS Study of Apatites and Related Calcium Phosphates (A. Lebugle and B. Sallek). Calcium Phosphate Deposition in Rat Kidneys (S.R. Kahn, J.H. Adair, A.A. Morrone, G.P. Latorre). Isolation of Calcium-Phosphate Crystals of Mature Bovine Bone by Reaction with Hydrazine at Low Temperature (H-M. Kim, C. Rey, and M.J. Glimcher). Author Index.